When not on line, the dial up modem automatically go into a power down mode and consumes only 5m amps while inactive. -40oC to +85oC Operating Temp. Ideal for Meters, Relays, RTUs, Controllers, etc. 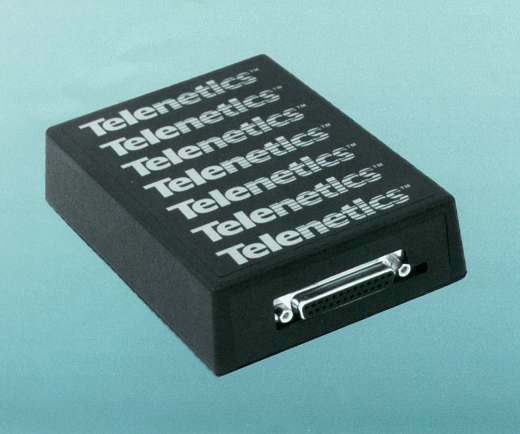 Telenetics has designed modems that work in "remote" remote sites with very low failure rates. These devices work where other modems roll over and die. When a service call to a remote site can mean an all day trip these modems are the ideal solution. The MIU/PowerPort modem is an industrial grade modem that can be powered directly through the RS232 (DB25) data interface port or power jack. MIU/PowerPort modem can be powered by delivering +5VDC (regulated) through pin 10 of the DB25. An optional 12VDC version is also available. Alternatively, an external jack allows the MIU/PowerPort to be powered from a wall transformer or other low voltage AC or DC power source. When not on line, the dial up MIUPowerPort modems automatically go into a power down mode and consumes only 5m amps while inactive. ...and operates over dial-up and 2 or 4-wire leased lines at full or half duplex as appropriate. The MIU/PowerPort modem has a sister product, the MIU/PowerPack, which is powered from an internal, rechargeable Ni-Cad battery. The battery draws its charging current from the DTEs RS232 interface or an optional solar panel. For more information, ask for the MIU/PowerPack brochure and specifications. The MIU/PowerPort is fully Hayes AT command set compatible with programmable S-registers. All models will operate in temperatures from -40 to 85oC and are surge protected on the analog line up to 5kV. The modem can also be powered from 6-9VAC or 7-16VDC to an external 2.1mm jack. after 45 seconds of inactivity. Draws 5mA in power down mode. Powers back up on receipt of DTR signal or incoming call. 5-3/8" x 4" x 1-3/8"
Important notes regarding leased line operation: 1 Bell202T is half or full duplex, suitable for point-to-point and multipoint applications. 2 The standard 9.6L & 14.4L models are 4-wire, full or half duplex, point-to-point only. 2-wire, full duplex, point-to-point available on special order.